If the LGMCA map (Bobin et al, A&A, 2014) presented above is used, then LCS has shown that this map is clean enough so no masking is required anymore for large scale statistical analysis. 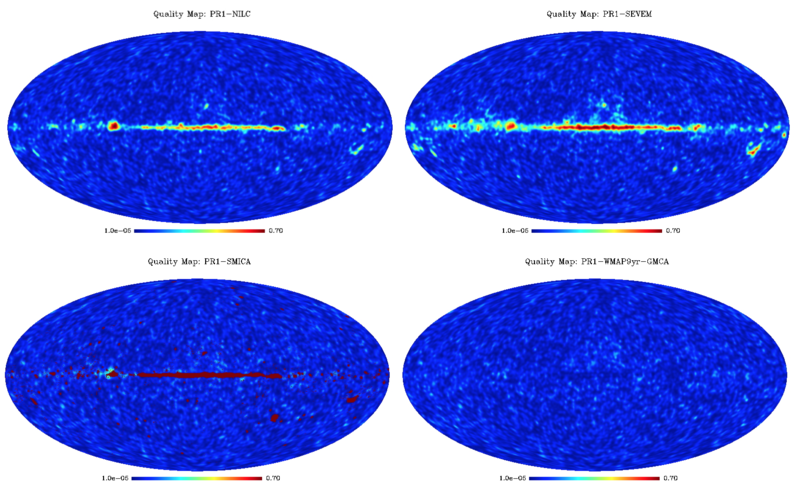 We have found the most claimed anomalies in the CMB map disappear if i) we do not mask, and ii) we take properly into account the Integrated Sachs-Wolfe effect (ISW) (Rassat and Starck, 2013). Similar results were obtained with Planck data and CMB large scales are therefore compatible with the standard l-CDM cosmological model (Rassat et al, 2014). Reference 1: A. Rassat, J-L. Starck, P. Paykari, F. Sureau and J. Bobin, "Planck CMB Anomalies: Astrophysical and Cosmological Foregrounds and the Curse of Masking",Journal of Cosmology and Astroparticle Physics, 08, id. 006, 2014. Reference 2: A. Rassat and J-L. Starck, "On Preferred Axes in WMAP Cosmic Microwave Background Data after Subtraction of the Integrated Sachs-Wolfe Effect", Astronomy and Astrophysics, 557, id.L1, pp 7, 2013. Press release 1: Science et Vie, August 2014. Press release 2: Défis du CEA, March, 2015.